What are the most popular online bachelor's degrees offered in Minnesota? Students interested in an online program in Minnesota can pursue their education in a state that has taken steps to reflect its dedication to affordable and quality higher education. The Minnesota legislature voted in 2013 to reject tax cuts for a number of high-earning households and businesses, enabling the state to prevent higher education cuts and freezing tuition for public colleges. In the same year, the MN Dream Act, also known as the “Prosperity Act,” became law, making undocumented students eligible for in-state tuition and financial aid. A number of tools are available for students interested in online programs and courses. Distance Minnesota, a group of four colleges, is an organization that provides a shared course catalogue as well as 24/7 support for students. The Minnesota Office of Higher Education also offers assistance on its website by identifying credible online programs, assessing your online learning readiness, and helping prospective students calculate costs and savings. And as a member of the Midwestern Higher Education Compact, Minnesota students are entitled to tuition reciprocity with other member states. One of the best online colleges in Minnesota, UM offers a variety of undergraduate degrees completely online, from Applied Health and Manufacturing Management, to Communication and Accounting. Coursework for partially online degree programs, including Social Work and Medical Laboratory Sciences, are available 50-80% online. The University’s main campus is located in Twin Cities (Minneapolis and St. Paul), and is home to 30,500 undergraduate students. Students can participate in more than 800 student groups, such as Cafe Culture, Entrepreneurship Club, and Hip Hop Lab. The school offers undergraduate and graduate certificates, graduate degrees, and doctorate degrees. The University has four other campuses in addition to Twin Cities. Alumni include former Vice President Walter Mondale and Tony Dungy, Super Bowl championship coach. University alumni have started approximately 10,000 companies. Online students resources include technology help; free training software for MS office programs, and a free mini course in Overcoming Your Tendency to Procrastinate. Concordia is one of the top online colleges in Minnesota. It offers 19 bachelor’s degree programs completely online, including business, exercise science, pulmonary science, and human resource management. The Cohort Learning Model utilized by on-campus students is part of the online student experience. Students are placed in groups for the duration of their program, which improves the depth and breadth of their educations. The Concordia Partnership Advantage provides online and on-campus students tuition discounts and priority admission for employees of partnering companies and organizations, from 7-Eleven and UPS, to Best Buy and local police and social service associations. Concordia is a Christian liberal arts university founded in 1893, with its main campus in St. Paul. On-campus students can participate in 16 NCAA Division II sports teams, ministry and Bible study groups, and the annual Strawberry Festival. In 2014-15, students volunteered nearly 8,000 hours through service learning programs. One of Minnesota’s online colleges is the Northwestern-St. Paul. At the bachelor’s level, only one online degree program is available: the bachelor of arts in Biblical studies. The degree requires 125 credits through courses including Bible Customs and Geography and Advanced Biblical Interpretation. An associate of arts and Bible and certificate in Bible are also offered online. Northwestern has online master’s programs in education, human services, theological studies, and more. The University is a Christian liberal arts institution located on the outskirts of Minneapolis-St. Paul, and the 107-acre campus is situated at Lake Johanna. Founded in 1902 with just seven students, it now enrolls 3,487 undergraduate and graduate students. Evangelical minister Billy Graham served as the University’s president from 1947-52. The university’s Northwestern Eagles are members of NCAA Division III. Northwestern Media, a University ministry, operates 15 Christian radio stations in eight midwestern cities. The Five16 Film Festival is a popular annual event presenting student films. Founded in 1868, Minnesota State - Mankato is one of the top online colleges in Minnesota. Accredited by the Higher Learning Commission of the North Central Association of Colleges, the University offers only online completion degrees at the bachelor’s level. These include: Applied Organizational Studies, International Business, Technical Communication, Dental Hygiene, and RN Baccalaureate Completion. Students utilize the Desire 2 Learn course management system. As the University is a member of NC-SARA, prospective students should ensure their state is a group participant. The University has a total enrollment of more than 15,000 students, including 1,100 international students from 90 countries. There are approximately 300 student groups, intramurals, fraternities and sororities on campus, and more than 2,000 students participate in service-learning programs. The University’s men’s and women’s hockey teams are NCAA Division I, while its other varsity sports are part of Division II. Crown is one of Minnesota’s online colleges. It’s a “Bible College” affiliated with the Christian and Missionary Alliance denomination, it offers biblically-based educations. Online degrees are available in Christian programs like Biblical studies and Christian ministry, including a variety of disciplines in business, psychology/counseling, and criminal justice. The school offers online certificates, minor’s, associate’s, bachelor's, and graduate degrees. Many study abroad programs are offered, giving students an experience they can’t receive domestically. Almost 50% of students participate in a serve trip before graduating or serve an off-campus community. Crown’s 215-acre campus is located in St. Bonifacius, which is 30 miles west of Minneapolis. There are 1,300 students enrolled at the College representing 20 countries. More than half of graduating seniors go on at least one missions service trip, and 25% of students participate in the College’s 16 NCAA Division III athletics teams. More than 70% of faculty members hold doctorate degrees. Located in Crookston -- a small picturesque town in northwest Minnesota -- UMC offers 15 online bachelor's programs, eight minors, and five certificate programs across a range of subject areas. Students can take all of their classes online, while also benefiting from the same flat tuition rate regardless residency. To qualify for admission, prospective students must have a high school diploma with a GPA of 2.0 or above. A minimum ACT score of 21 or SAT score of 980 is also required. Those who do not meet these standards may still be admitted upon a committee’s review. As one of the first schools in Minnesota to offer online bachelor's degrees, UMC is a pioneer in meeting the needs of adult distance learners. Students have access to their instructors and fellow learners, and the school features a friendly transfer policy that accepts credits from other Minnesota colleges and universities. Bemidji State is one of the best online colleges in Minnesota. Students can pursue seven, 100 percent online bachelor degree programs, but they are all completion degrees. 24 college credits must have already been obtained prior to enrollment. The available online degree completion programs include: accounting, applied engineering, applied management, business administration, criminal justice, marketing communication, and psychology. There are three hybrid online bachelor programs: elementary education, nursing, and social work. Courses are taught through the Brightspace Learning Management Platform. Online student resources include database access and nearly 34,000 electronic periodical titles. The University has approximately 5,000 undergraduate and 300 graduate students. It operates the American Indian Resource Center, which delivers outreach and educational programs. Intramurals like flag football and dodgeball, student clubs, and music and theater productions are popular. Students can rent University snowshoes, camping equipment, kayaks, canoes, and more for their enjoyment. Winona State has five colleges: Business, Education, Liberal Arts, Nursing and Health Sciences, and Science and Engineering. As one of Minnesota’s online colleges, it offers a wide variety of courses online utilizing the Desire to Learn platform. Only one degree program is fully online: the healthcare leadership and administration online completion degree. The school offers over 100 online non-credit courses and certificate programs. The University’s main campus is in Winona, and it has two other locations. The Rochester campus offers a variety of bachelor degree completion programs on-site, such as Accounting and Nursing. Approximately 8,500 students are enrolled at the University, and on-campus students enjoy a wealth of art, music, and theater opportunities. Student groups like Jazz Club and Geology Club, along with intramural sports - including volleyball, softball, football, basketball, and soccer - are popular activities. The “Warrior Athletics” comprise of 13 NCAA Division II teams. Minnesota’s online colleges include Minnesota State-Moorhead. The school offers more than 100 online courses, but only has four fully online undergraduate degree programs. They are all bachelor of science degree completion programs: business administration, RN to BSN, operations management, and project management. Minnesota-Moorhead offers master’s programs including nursing, special education, and educational leadership; master’s certificates are available in school counseling, professional counseling, and nurse educator. Online programs are taught through the Brightspace learning management platform and WebEx is used to conduct synchronous meetings. Students have the opportunity to participate in one of 15 Learning Communities, which assist with improving GPAs and increasing campus involvement through support and collaboration. With more than 100 student organizations, from Anime Club to Cricket Club, along with Greek Life and intramural sports, on-campus students enjoy a variety of activities. The Dragon Athletics include 14 varsity teams and are members of NCAA Division II. Saint Scholastica is a Catholic Benedictine institution that was founded in 1912. With both online and virtual classroom platforms available to students, it is also one of the best online colleges in Minnesota. Online degree programs include nursing, health information management, computer information systems, and more. Online students receive a personal advisor to help with course planning and support, and access to counseling, tutoring, and advising. Learners benefit from the online programs small class sizes, resulting in individualized attention. While the college has 10 locations in Minnesota and two in Arizona, its main campus is in Duluth, which is home to 1,770 full-time undergraduates. The 186-acre campus is adjacent to Lake Superior. Students participate in Community Day (meal preparation for those in need, reading to elementary students, etc. ), Homecoming, and the All-School Christmas Party and Christmas Tree Lighting Ceremony. A sampling of student groups are the Art Club, Earth Action, Figure Skating Club, and The Cable newspaper. The Saints Athletics teams include men’s and women’s hockey and basketball. A private nonprofit Christian college, Bethel University offers 35 distinct online programs, including 26 graduate programs, six bachelor's degrees, an associate degree, and certificates in addiction studies and alcohol and drug counseling. Bethel’s variety has made it one of the top online schools in Minnesota. Resident and non-resident students pay the same tuition rates, and are charged per credit based on the programs in which they are enrolled. The school has a friendly transfer policy that accepts credits from most accredited colleges and universities. Enrollment counselors help ensure students move through their programs as efficiently as possible. Specific admissions requirements differ by program, however Bethel offers an easy online application that can be completed in minutes. The school’s main campus is located in Arden Hills, a suburb just north of the Twin Cities. Bethel was founded in 1871 and currently serves more than 6,000 students. A member of the Minnesota State Colleges and Universities system, Metro State University offers a variety of online degree programs designed for adult and distance learners. Programs range from business administration and management, to public administration and human resource management. Students can also access Minnesota Online, a digital catalog of more than 6,500 courses. The school accepts transfer credits from most accredited institutions of higher learning. First-time students must have a high school diploma and rank in the top half of their graduating class. They must also have an ACT, SAT, or PSAT score at or above the national median. Once enrolled, students benefit from a range of services, including academic advising, tutoring, and career development assistance. Scholarships and grants are also available for those who need help paying for school. Metro State's main campus is in St. Paul, the state’s capital city. With 13 graduate degree programs available, Saint Mary's University is among the most respected online colleges in Minnesota. The Minneapolis-based school delivers content via iPads shipped to each student. The asynchronous coursework is designed for students to take in lectures and complete assignments when it’s most convenient for them. Online students also have 24/7 access to the university’s comprehensive digital library. To gain admission, prospective students must have an undergraduate degree from a regionally accredited college or university, along with a GPA of 2.75 or above. Incoming international students may also need to demonstrate their English language proficiency. In addition to its graduate programs, Saint Mary's has an accelerated online bachelor's of nursing degree that can be completed in one year. The school is regionally accredited by the Higher Learning Commission. UM-Duluth was established in 1895 as a teacher’s college. It is one of five campuses of the University of Minnesota with a total enrollment of 10,878 students and 526 full-time faculty. As one of the best online colleges in Minnesota, it offers a bachelor degree in psychology completely online. The social work bachelor degree is a hybrid online program. Moodle is the University’s online course management platform. Non-credit degrees are available in gambling addiction studies, construction project management, sustainable management, and others. The 244-acre Duluth campus is adjacent to Lake Superior, and on-campus students enjoy art exhibits, opera, jazz concerts, and theater productions produced by the School of Fine Arts. Men’s and women’s hockey is part of NCAA Division I, while the other varsity sports teams are members of Division II. Activities include intramural sports, fraternities and sororities, and social, political, religious, and academic clubs. Oak Hills Christian College offers a range of undergraduate and graduate degree programs completely online. Known as one of the best online colleges in Minnesota, Oak Hills provides a Bible-focused education to students across the globe. Online courses are available throughout the year, each with a dedicated instructor students can communicate with directly. All coursework takes place via an easy-to-navigate online student portal. Students also benefit from the school's friendly transfer policy, as Oak Hill accepts credits from nearly all accredited institutions of higher learning. Incoming freshmen must have a high school diploma or GED, and also must have achieved an ACT composite of 18 or SAT composite of 860. A high school GPA of 2.0 is also required. The college is located in Bemidji, MN, and is fully accredited by the Commission on Accreditation of the Association for Biblical Higher Education. Our affordability methodology considers value-driven metrics and ranks schools that have low tuition rates, as well as proven graduation rates and employment outcomes that provide a high ROI for students. For students in Minnesota, there are plenty of opportunities to find an affordable program locally. While distance education provides more flexibility than an exclusively residential curriculum, there are still plenty of advantages to attending a local online college, including access to lower tuition prices and local scholarships. If you're considering going back to school, and are thinking about studying online, the following list of cheap accredited online colleges in Minnesota will help you start your search. Heralded as one of the country’s most prestigious research institutions, the University of Minnesota Twin Cities in Minneapolis is the flagship campus within the University of Minnesota system. Faculty members have earned MacArthur and Guggenheim Fellowships, as well as the prestigious Nobel Prize. U of M’s highly-reputed online courses permit learners the flexibility necessary to earn their degree and advance professionally. The university offers fully, primarily, and partially online undergraduate and graduate degrees including programs in marketing, information technology management, business administration, and health informatics. Nonresidents pay a slightly higher tuition than residents, but the university remains one of the most affordable online colleges in Minnesota. Minnesota State University Mankato accommodates working professionals online, allowing them to apply lessons learned to their career practically. With more than 30 online degrees and certificates, it is one of the top online colleges in Minnesota. Distance learners complete their degree entirely online, selecting among bachelor’s programs like applied organizational studies and dental hygiene or earning a master’s degree in accounting and education leadership. Tuition fees depend on the student’s state of residence, but they can apply for financial aid. Additionally, the college honors educational benefits from the U.S. Department of Veteran Affairs. Metropolitan State University offers quality academics that permit busy adults the flexibility necessary to earn their degree remotely. Highly experienced faculty deliver relevant and rigorous instruction, equipping students with the knowledge necessary for career advancement and workplace success. While some degrees are available entirely online, most online classes at Metro State complement in-person courses. Fully online programs are available only to residents of Minnesota and those whose states participate in a National Council for State Authorization Reciprocity Agreement. Furthermore, Metro State's Center for Online Learning reflects the college’s commitment to outstanding teaching and learning. It collaborates with professors as they design their courses and integrates innovative technologies to facilitate learning so online students achieve their academic goals. Located in St. Paul, Bethel University is a Christian institution that promotes both academics and community leadership. With nearly 90 majors to choose from, the university builds learners’ classroom knowledge while helping them with their spiritual and personal development. One of the most affordable online colleges in Minnesota, Bethel offers adult undergraduate, graduate, and even seminary degrees online. Online programs include a bachelor’s in management information systems, master’s in ministry, and doctorate in K-12 administration. Tuition is the same for all students, and courses begin throughout the year, allowing distance learners to enroll anytime. The University of Minnesota Duluth enrolls more than 11,000 students from the U.S. and abroad. One of most respected colleges in Minnesota, UMD’s reputation for quality academics at an affordable price attracts students who value these kinds of advantages. The school's online program offers undergraduate and graduate degrees, along with continuing education programs. The college delivers classes fully, primarily, and partially online in several fields, including applied health, sport and recreation management, and computer science. Online students typically pay the same tuition as Minnesota residents regardless of where they reside. Transfer students may also be able to apply previously earned credit to their degree and should consult their academic department to determine eligibility. Guided by its abiding commitment to the Catholic faith, The College of St. Scholastica boasts a reputation for exemplary teaching and learning spanning more than a century. With over 4,000 students, it offers classes both in-person at its Duluth campus as well as online. Those who enroll in online studies receive access to multimedia presentations, engage in discussion boards with classmates, and enjoy a highly-collaborative learning experience that bridges the geographical divide. St. Scholastica offers several online degrees, including programs in accounting, elementary education, health informatics, and nursing. Online students communicate regularly with personal advisors. They can access the same student services as their on-campus peers, including counseling and tutoring support. St. Cloud State University boasts a commitment to experiential learning that prepares students for the world of work following graduation. Located in St. Cloud, the university ranks among the best values in colleges in Minnesota. Those enrolled in St. Cloud State’s online programs can study anywhere at anytime, selecting from among over 200 courses each semester. Undergraduate programs include elective studies and nursing while graduate programs include criminal justice and technology integration. Online learners receive library and student disability services support, which further permits degree attainment. In compliance with state and federal regulations, the university cannot enroll students who live in Massachusetts. The largest private college in Minnesota, the University of St. Thomas enrolls an estimated 10,000 students representing every state and 63 countries. The school offers more than 100 undergraduate and 60 graduate degrees. St. Thomas learners can choose among 18 online and blended programs for graduate and professional degree seekers. Taught by the same faculty who instruct on-campus classes, these programs include master’s degrees in special education, business administration, and healthcare. The university also offers select undergraduate courses online and allows students to enroll during the summer term with no or very few visits to campus. Tuition is the same for all students regardless of their state of residence. A Christian university founded in 1902, University of Northwestern St. Paul is home to an academically-inclined student body geared toward strong faith and high moral character. With nearly 3,500 students enrolled in undergraduate and graduate degree programs, UNWSP also ranks among the most affordable online colleges in Minnesota. Its online programs offer undergraduate and graduate degrees in addition to online classes. The university’s PSEO program permits high school students a dual enrollment opportunity. There are over 60 semester-long classes for earning college credit if students maintain at least a 2.75 high school grade point average and meet one of UNWSP’s standardized testing requirements. UNWSP also offers over 80 early college courses for high school students. Concordia University, St. Paul offers a variety of associate, bachelor’s, master’s, and doctoral degrees online. Online programs include accounting, criminal justice, educational leadership, and forensic behavioral health. Distance learners in these programs participate in classes and submit all coursework through CSP’s online system. None of CSP’s degree programs require an application fee and the university pays all costs for official transcripts submitted with applications except for those applying to graduate education programs. Additionally, CSP provides a discount on undergraduate tuition for active duty service members as well as scholarships for military, veterans, and their spouses who receive neither Yellow Ribbon Program nor Vocational Rehabilitation Program benefits. A public university founded in 1858, Winona State University is the oldest member of the Minnesota State Colleges and University System. Its nearly 8,400 students enroll in more than 80 programs thanks to its reputation for quality and affordability. WSU offers synchronous and asynchronous online classes as well some requiring in-person classroom meetings. Distance learners have access to the university’s library and tutoring services like their on-campus peers. Working adults who wish to apply to WSU’s Adult Entry Program must have a high school diploma or GED (earned at least four years before applying) and must not have earned college credits within 12 months of applying. Military experience following high school may also qualify applicants for admission. Established in 1919 with just 38 students, Bemidji State University now delivers high-quality, high-value education to more than 5,300 undergraduate and graduate students. A standout among affordable online colleges in Minnesota, BSU has students pay the same tuition regardless of their home state. BSU offers fully online and hybrid courses designed for distance learners who have completed the equivalent of two years of college coursework. The university offers several online bachelor’s degrees, including programs in accounting, marketing communications, and psychology. Online students have access to BSU’s support services like advising, tutoring, and library resources. Oak Hills Christian College is an interdenominational institution that provides biblically-centered higher education that prepares students to meaningfully contribute to society. As part of the curriculum, all students take classes in Christian ministry. The college offers online associate degrees in biblical studies and ministry and business administration; it offers online bachelor’s degrees in business administration and leadership and ministry. All Oak Hills online degree programs are available fully online in an asynchronous format. Additionally, there is no cap on how much credit students may receive for prior learning, and the school also grants credit for approved workshops, self-study programs, and previous work experiences. Minnesota State University Moorhead offers affordable online degree programs for students who wish to complete a degree that they've already begun. It offers graduate degree programs in online and hybrid formats, ensuring all students equally rigorous and engaging curricula whether they study on or off campus. MSUM’s online degree programs include special education, nursing, and global supply chain management. Students choose from more than 100 online courses each semester. Tuition costs depend on state of residency, but Minnesota, North Dakota, and Wisconsin students pay in-state tuition. Admission to an MSUM online degree program requires completing at least 24 college credits in previous schooling with at least a 2.0 grade point average. A Christian school that marries academic excellence and spiritual transformation, Crown College is a private, highly-affordable online college with nearly 60 accredited degree programs. It offers online programs for undergraduate and graduate degrees, which allows distance learners to integrate their faith into their studies. Crown awards online associate, bachelor’s, and master’s degrees as well as online classes allowing high school students to earn college credits. While most applicants for online degrees should have already earned at least 24 college credits, those who have not can submit a high school transcript with their application. Additionally, all applicants should submit a transcript from any postsecondary institution attended, including colleges and vocational schools. There are a few programs in Minnesota to help colleges and universities in the state improve their online options. The Minnesota Online Quality Initiative provides resources and tools for faculty and administrators to develop effective online curriculums. Additionally, Distance Minnesota is an online learning consortium of four schools that offers students several degree paths entirely online. Additionally, the platform provides several services for online students, including advising, an online courses database and support programs. As more schools offer more online programs, the time is right to pursue an online degree in a Minnesota college or university. 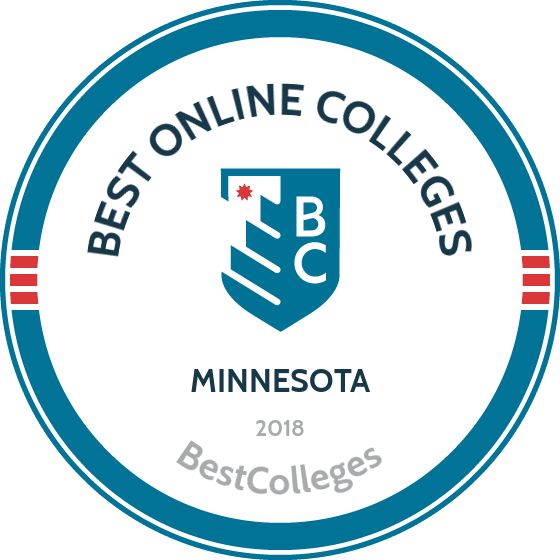 Browse our list of the best online colleges in Minnesota for more insight into distance learning programs in this state. According to an NCES report from 2012, of the roughly 455,000 students enrolled at Minnesota colleges and universities in 2012, 26.2% of them were enrolled exclusively in distance education courses. Employment growth in this profession is moderate in Minnesota. According to the Minnesota Employment and Economic Division, long term projections show an increase of 8% in the total number of jobs between 2014 and 2024. Wages decreased by 2% from 2011-2016. In 2016, what were the top careers in Minnesota for people who had a degree in business administration and management? Data source: Minnesota Employment and Economic Division, Bureau of Labor Statistics. Data may not be available for every year. Employment growth in this profession is strong in Minnesota. According to the Minnesota Employment and Economic Division, long term projections show an increase of 18% in the total number of jobs between 2014 and 2024. Wages increased by 7% from 2011-2016. In 2016, what were the top careers in Minnesota for people who had a degree in health/health care administration/management? Employment growth in this profession is strong in Minnesota. According to the Minnesota Employment and Economic Division, long term projections show an increase of 20% in the total number of jobs between 2014 and 2024. Wages increased by 13% from 2011-2016. In 2016, what were the top careers in Minnesota for people who had a degree in accounting? Employment growth in this profession is moderate in Minnesota. According to the Minnesota Employment and Economic Division, long term projections show an increase of 13% in the total number of jobs between 2014 and 2024. Wages increased by 4% from 2011-2016. In 2016, what were the top careers in Minnesota for people who had a degree in registered nursing? Employment growth in this profession is strong in Minnesota. According to the Minnesota Employment and Economic Division, long term projections show an increase of 19% in the total number of jobs between 2014 and 2024. Wages increased by 11% from 2011-2016. In 2016, what were the top careers in Minnesota for people who had a degree in criminal justice/safety studies?